When I buy my Easter or Christmas ham, I always buy a bone-in ham. The bone makes the most wonderful soups. I always think of ham bone soups as a free meal, because it makes a second meal out of inexpensive ingredients. In this recipe, I used lentils as the soup base. You could do this recipe with beans or split peas, but lentils were what I had around when I made this up. This is not a pretty soup, but it does taste good. When I served it to my boys for dinner tonight, we had quite the discussion about needing to taste it before we decide that we don’t like it. And what do you know? All three liked it and two even asked for seconds. Amazing. That sort of thing never happens around here. Really. Never. Then as I was taking a photo of the soup, my eight year old asked me if anyone ever reads my website. I had to admit that I’m pretty sure no one reads my site. But, if you’ve made it this far, then you’ve proven me wrong! Yeah! I hope you enjoy this soup as much as we did. This recipe makes a big batch. Once its cooled, I freeze half of it for another day. Serve with crusty bread and a salad and you have a easy, healthy meal. This is a perfect way to use up that leftover ham bone, but if you don't have a ham bone, you can use a cup of cubed ham, a smoked pork chop or just leave it out. 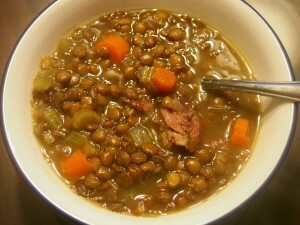 You can also switch out the lentils with soaked, dried beans or split peas. In a 6-quart or larger pressure cooker, heat the oil and saute the onion until soft. Place lid on pressure cooker and bring to high pressure over high heat. Lower heat and pressure cook for 10 minutes. If using an electric pressure cooker, program for 10 minutes on high pressure. Remove ham bone and bay leaf from the soup. When bone is cool enough to handle, use a knife to remove any remaining ham pieces and return them to the soup. Serve with crusty bread and a salad.